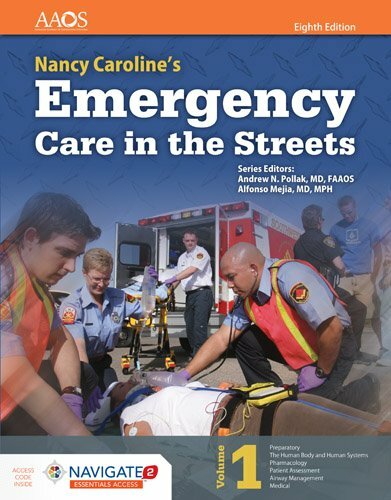 1284104885 -Nancy Caroline’s Emergency Care in the Streets, Eighth Edition is the next step in the evolution of the premier paramedic education program. This legendary paramedic textbook was first developed by Dr. Nancy Caroline in the early 1970s and transformed paramedic education. Today, lead editors Bob Elling and Barb Aehlert, with the American Academy of Orthopaedic Surgeons, are proud to continue this legacy and set the new gold standard for the paramedics of tomorrow.